Regardless of industry, one of the highest priorities for businesses is connecting to and communicating with their audiences. Whether that’s reaching out to segments for marketing, interacting 1-on-1 with sales prospects, or responding to customer requests, the challenge remains the same: to get the right message to the right people, at the right time. Text messaging is now one of the most powerful tools than can be leveraged to get the message out and fuel business growth. The problem is that, like email, a one-size-fits-all approach doesn’t lead to successful messaging. The key to creating the most effective messaging programs is to utilize industry-specific, personalized texting so that your audience knows you truly care and recognize their needs. A common obstacle that business owners and leaders face when trying to implement text messaging programs is how time consuming and resource intensive the process actually is. With coding and testing, defining the right content, planning campaigns, and writing message flows, the struggle is real and can take months to even start texting. At SMS-Magic, we believe you should focus on your business, not cumbersome technology projects. That’s why we built Converse Industry Solutions. We built Converse with Clickable Configuration Wizards to eliminate coding with a few simple clicks. Users can breeze through the set-up and implementation process and quickly launch powerful campaigns that are tailored to meet specific business goals. Marketing, sales, and service teams have different goals with their messaging. That’s why Converse features desks with intuitive, intentional interfaces for each function that boost productivity and performance. Intuitive interfaces and guidance systems in Converse empower users to build and deploy robust messaging programs that generate results quickly. Converse’s configuration and setup wizards make it so simple even users can create and launch campaigns. No more waiting for the availability of a Salesforce admin resource. 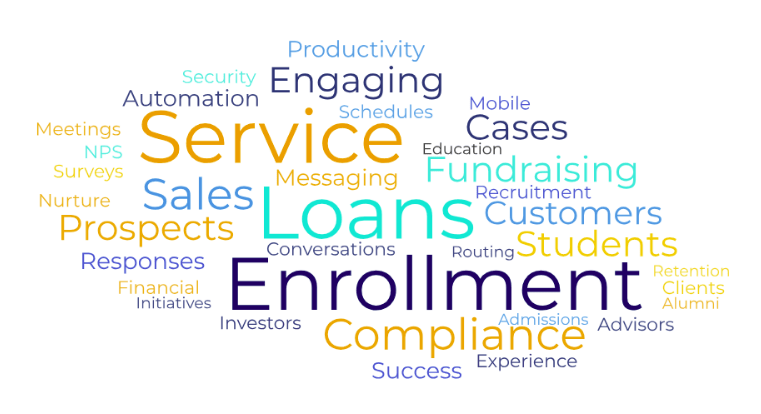 When the time comes to implement text messaging or overhaul existing programs at your company, remember to consider the importance of an industry-specific, personalized messaging strategy. Not only will your audience feel valued and appreciate you for it, your business will reap the benefits. To learn more about building successful messaging programs for your industry, you can download our best practices guides for General Business, Staffing, Higher Education, Financial Services, and Real Estate.